It’s the spookiest time of the year! 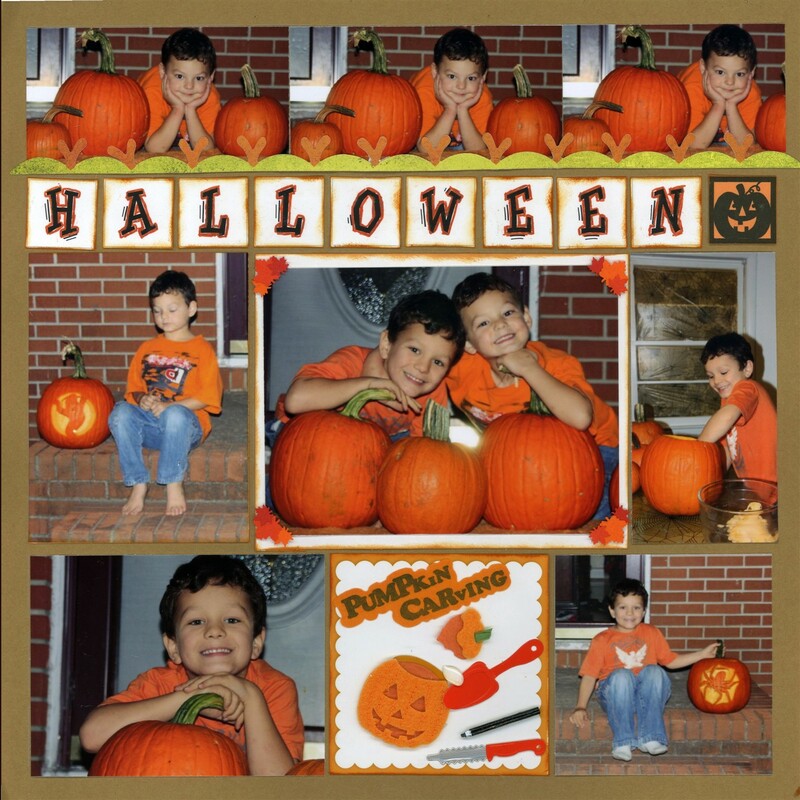 Are you getting ready to make your Halloween scrapbook pages? Whether you’re having trouble coming up with ideas or just looking for a new style, you’re in luck! In today’s post I listed 7 different Halloween layouts to get you inspired for upcoming pages. So keep scrolling to see what creepy and fun scrapbooking inspiration you can gather. Have you ever used large chunks of patterned paper on your Mosaic Moments pages? There is some adorable halloween paper out there, and sometimes you want to show it off! On this page, Tami placed a small photo over a large piece of patterned paper. This way you can see more of the paper itself and the cute designs. You can give some variety to your mosaic pages by covering a side of the grid with a large border of patterned paper (as shown). You can place 2 or 3 photos on top to get a ‘bulletin board’ look. If you love making different foods and desserts, consider creating a recipe page. 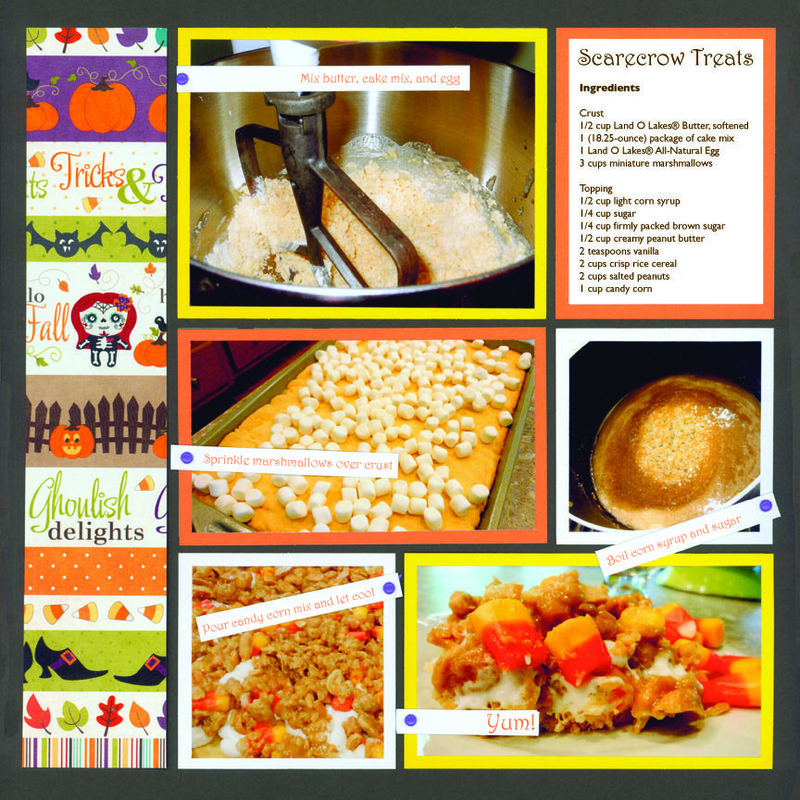 It’s more appealing to make a recipe when the step-by-step process is shown through photos. Take Photos of Ingredients and Step-by-Step Process before you begin your page. Put your photos in order of recipe directions. Give Your Layout some Character! 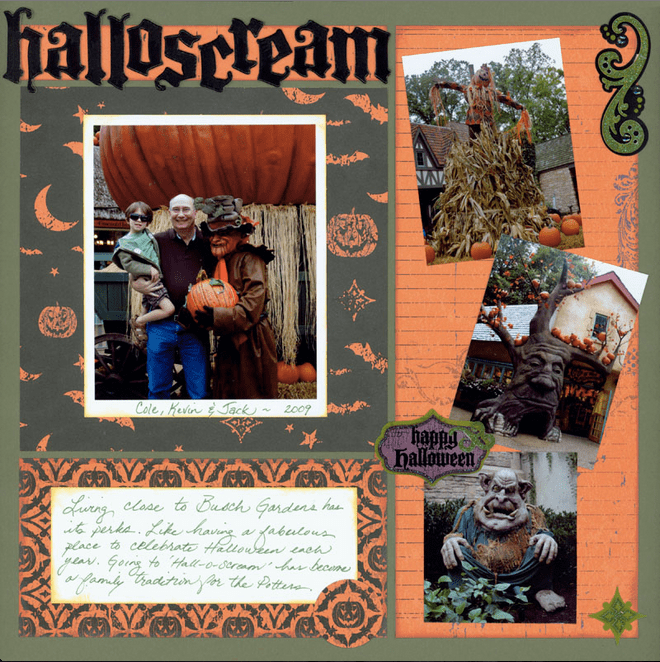 Most Halloween scrapbook pages have traditional colors such as black, white, yellow, and orange. If you are tired of using the same colors over and over again, or if you just want to make something different, consider using colors based on a character. 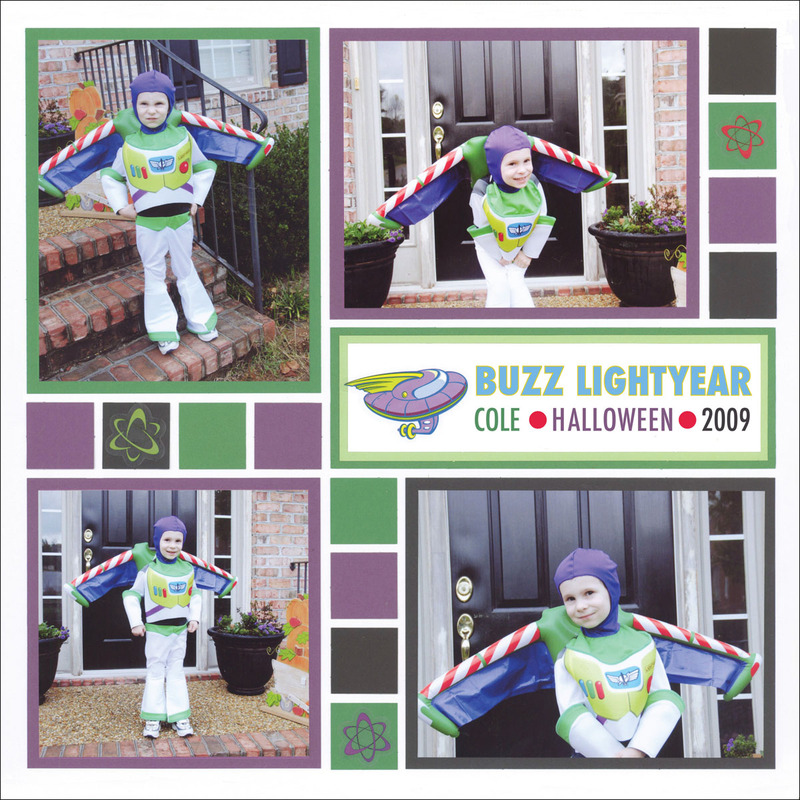 Each year many children and adults want to be a different person or character on Halloween. So, why not use inspiration from the costume? As you can see this page was inspired by Buzz Lightyear. The chosen Paper Tile colors and White Grid paper are based on his clothing. I also added some outer space stickers since it fit the theme. Halloween doesn’t always need to be so dark and creepy. Brighten it up with fun colors. This page has the traditional Orange, White, and Yellow with some purple. It’s bright, cute, and kid friendly. Make sure the colors and embellishments you choose match the theme in your photos. There are many bright and fun critters in these images, so a dark or scary theme would not make sense. 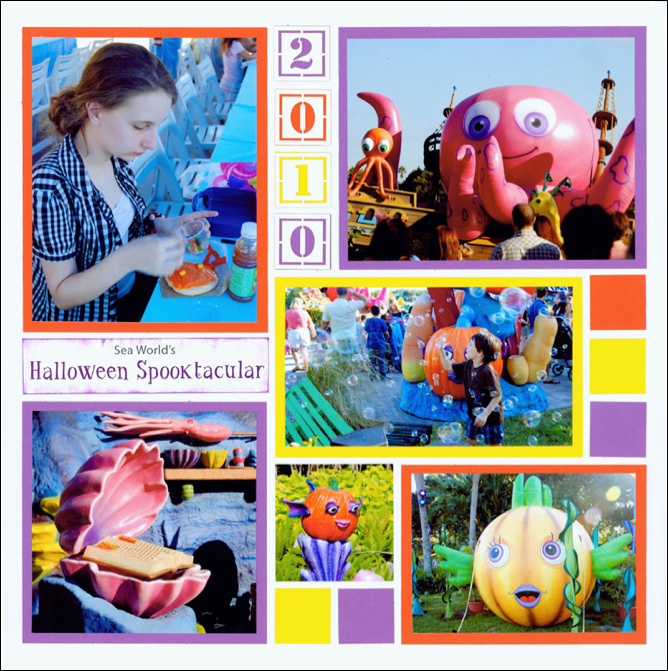 Also, the photos were taken at Sea World, and I didn’t think it would make sense to add the usual Jack-O-Lantern embellishments. Instead, I chose similar colors shown in the photos to make a cute and child friendly layout. Scrap Your Candy & Goodies! If you are going to a party or will have lots of candy on Halloween night don’t forget to scrap all the yummy treats! This page shows desserts made for a surprise party. Aren’t they so fun? I definitely wanted to remember everything we made. The colors on here have a neon look. These are great colors for a Halloween party or a page about a teenager. If you want this look, place bright colored Paper Tiles, such as orange, yellow, green, etc. over Black grid paper. I also found some fun stamps that fit in with the creepy theme. Do like showing off cute embellishments on your pages? Theresa used a block on the bottom just for showing stickers! This is a great option if you do not have enough photographs to cover the page or if you would like to add a large embellishment. Mosaic Moments™ isn’t just for photos! You can also place fun elements as well! 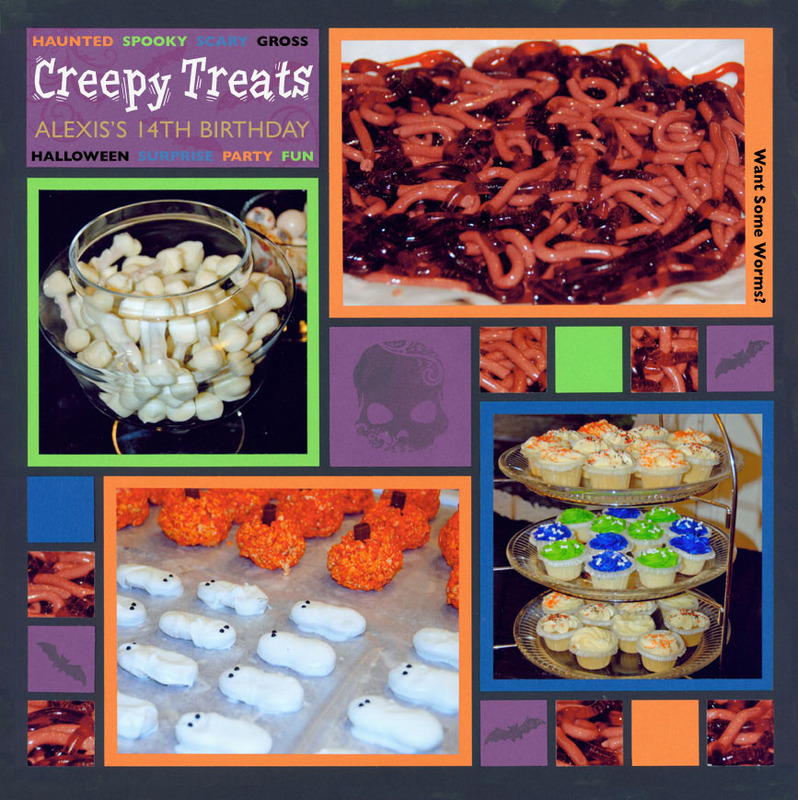 Theresa made the “Halloween” title with our Free Halloween Printable. To add some interest, she outlined the letters with an orange pen and used chalk ink around the edges. You can also print the downloads on different colors of paper. The Jack-O-Lantern from the download was printed on Orange paper, rather than white. Viewers beware! 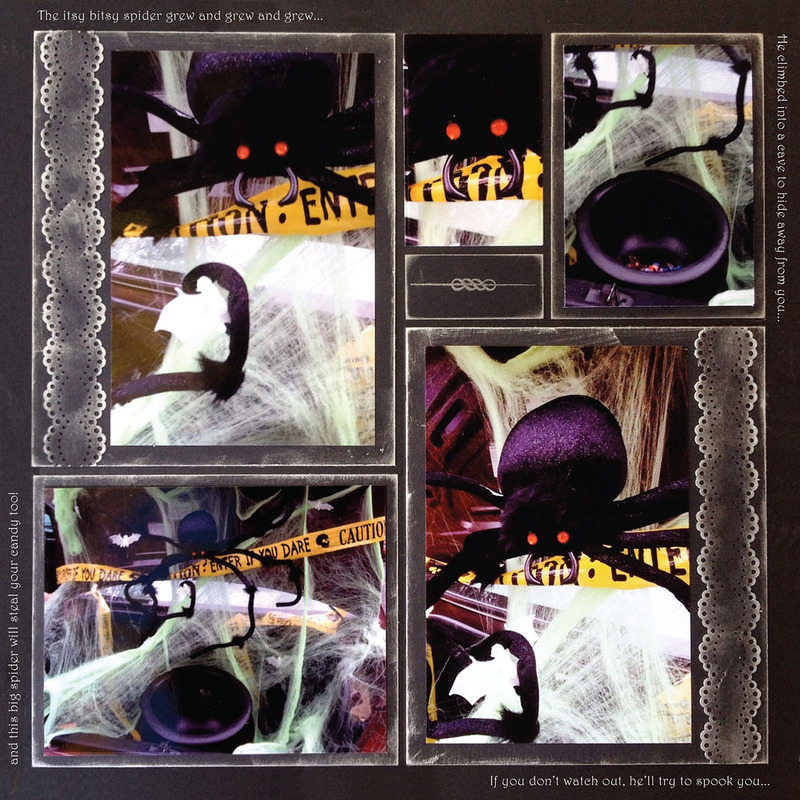 A large spider has taken over this scrapbook page! If you have photos that totally creep you out, it’s the perfect opportunity to make an awesome, dark page. For a creepy style layout, it’s a must to use black! I even placed Black Paper Tiles over the grid paper. To see the tiles better, I used silver chalk ink around the edges. Another important element is layering. When your page uses the same color, it’s important to add interest through layering different types of papers and textures. Here I added lacy looking borders on the larger tiles and covered them with chalk ink. Now they have a ‘glow’ look to them – perfect for a haunting layout!